生火腿起司拉麵是東京米其林推薦 Due Italian 日本拉麵的招牌料理, 是信義新光三越 A4 餐廳之一. 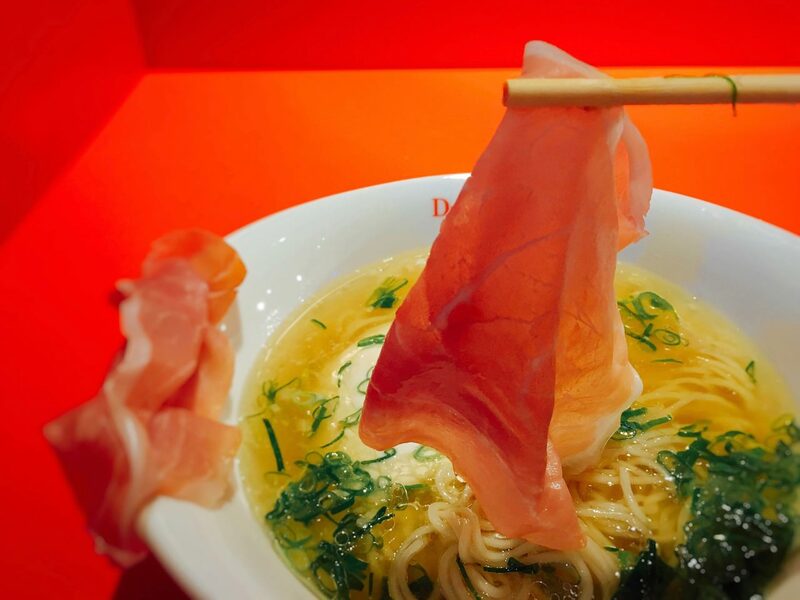 Chicken Broth Ramen with Iberico Ham & Cheese is Due Italian Ramen Restaurant’s signature dish. 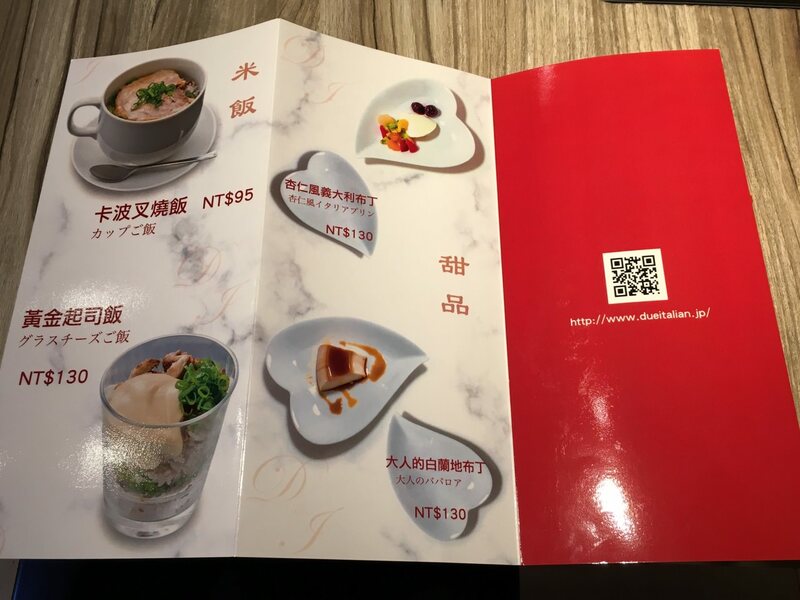 It is one of the Xinyi Shinkong Mitsubkoshi A4 Department Store’s restaurants. 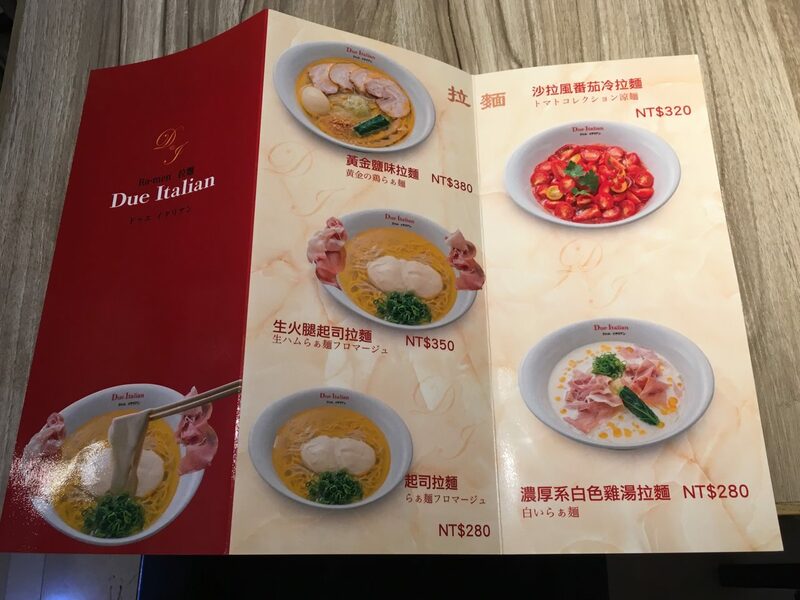 Due Italian 餐廳位置在新光三越 A4地下二樓美食街, 並不是公開的用餐位置, 但並沒有像二樓的 “Herbivore 餐廳” 圍起來, 廚房為開放式, 裝潢以白與紅為主, 完全沒有傳統日本主題裝潢, 反而像義大利輕食餐廳. 菜單拉麵品項跟有松露醬的“TSUTA 蔦拉麵”一樣帶異國風情. 座位有吧台區, 也有適合四人的座位, 餐具在桌上, 開水則是較不方便地放在櫃台. 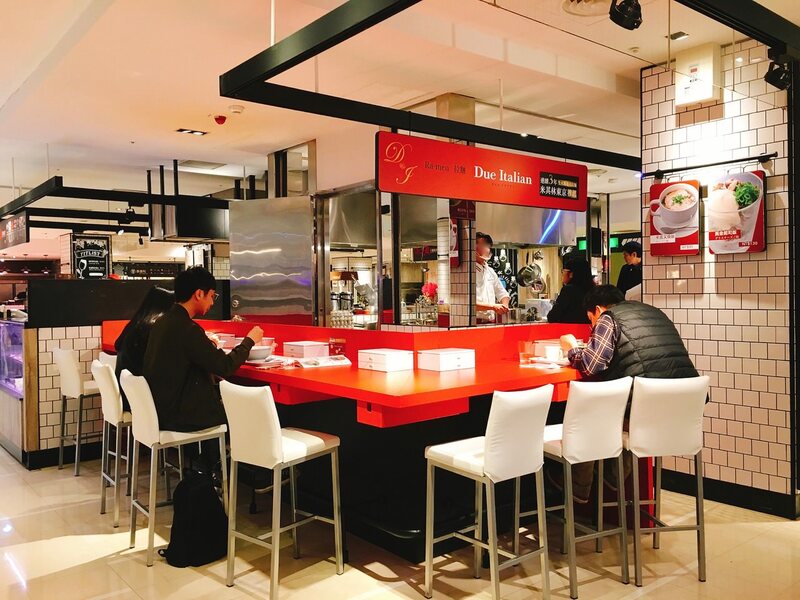 Due Italian restaurant is located at the A4’s B2 food court. It is not a public dining area, but it is not separated like “Herbivore Restaurant” at the 2nd floor. 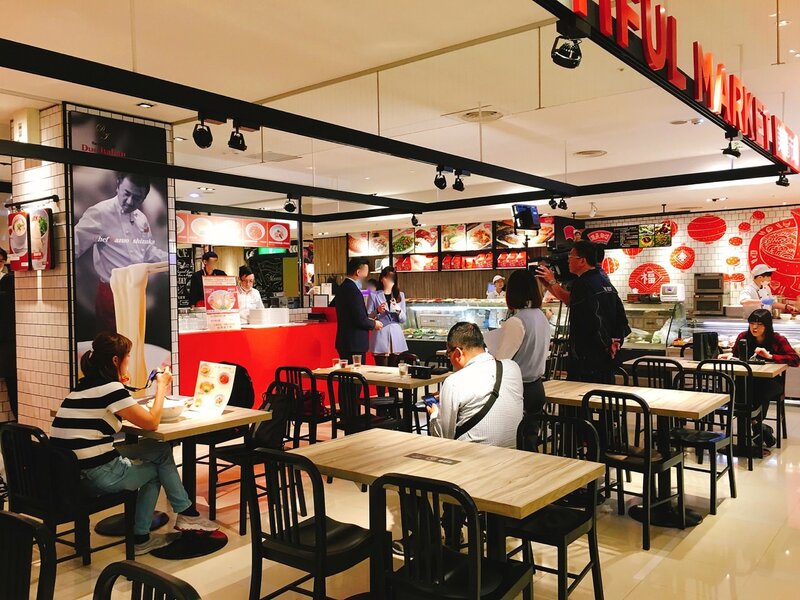 It has open kitchen and its decoration is mainly white and red. It doesn’t have traditional Japanese decoration. It is more like Italian restaurant that offers light food. 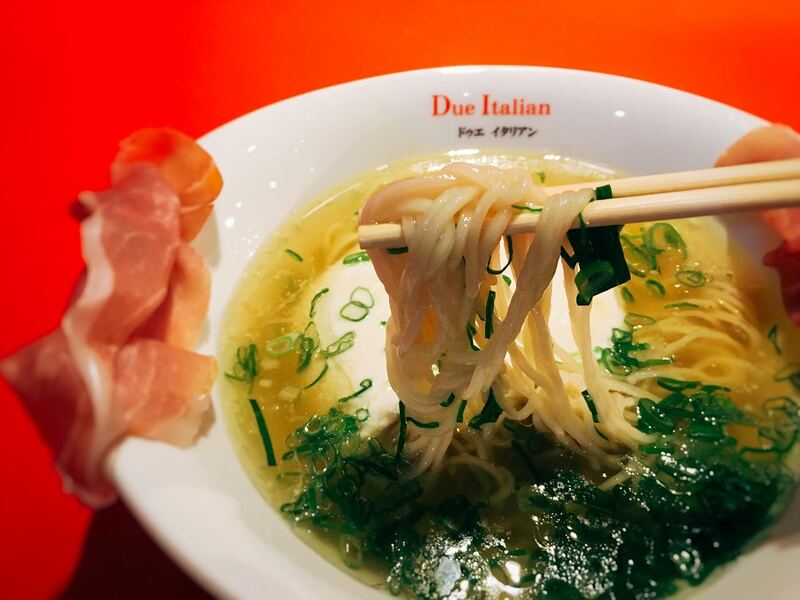 The menu is similar with “TSUTA Ramen”, which has foreign element. It has one-person seat at the counter and also 4-people seats. The utensils are at the table, however, the water is placed at the cashier counter. 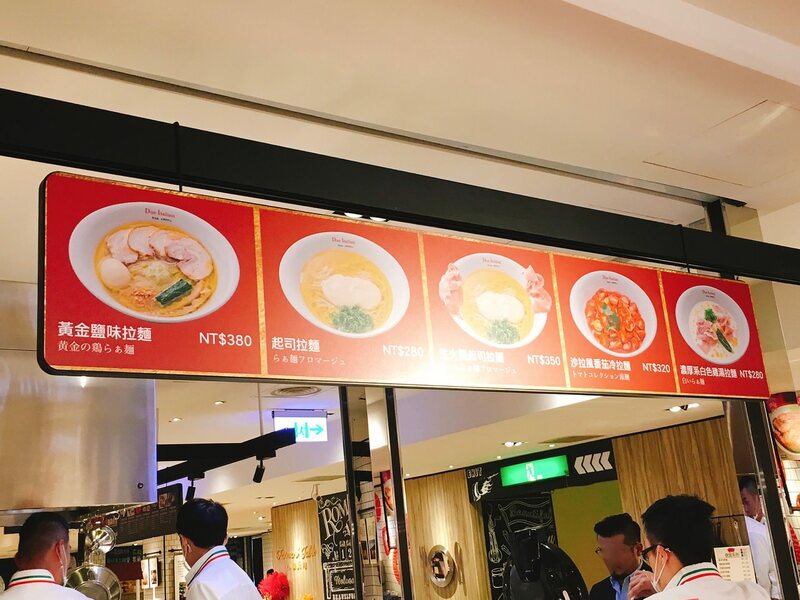 Correct Order SOP: Find the seats -> Order at the cashier counter -> Pay prior -> Get the number beeper -> Receive the order at the counter -> After finishing, the customer would need to put the plate to the public recycle area. 視覺上跟義大利國旗紅綠白一樣, 淡黃色鹽味雞湯上, 放了兩瓢白色馬茲瑞拉起司, 粉嫩透光的西班牙伊比利火腿放置在碗的兩旁, 最後再以青綠色蔥花點綴. 再還沒攪拌起司之前, 建議先品嚐湯, 湯頭跟 “麵屋真登”一樣皆是有適度鹹味, 雞湯香氣濃郁, 蔥花完全不會影響到湯頭, 單喝尚未攪拌起司的湯頭相當不錯. This dish is mainly red, green, and white. 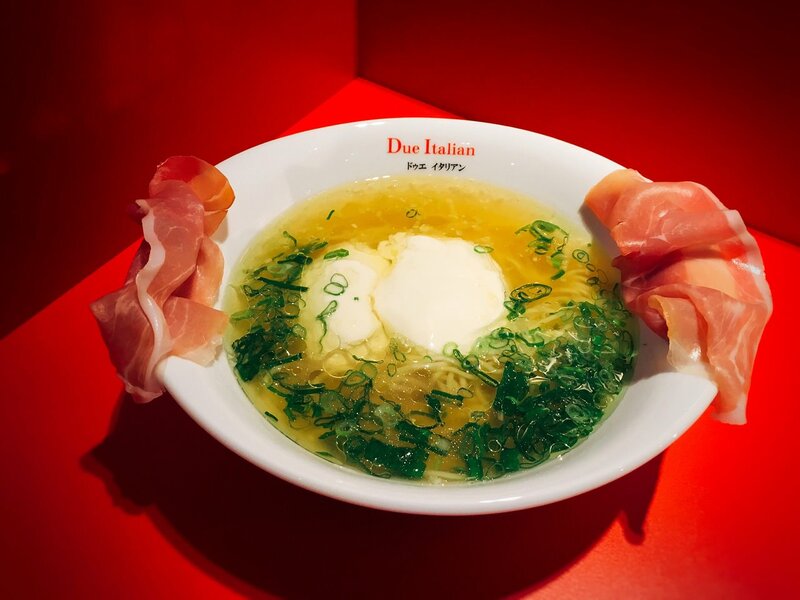 Light yellow color chicken broth has two mozzarella cheese on the top and fair amount of green onion. The pink Iberico Hams are placed at the sides of bowl. Before mixing the cheese, I tasted the broth. 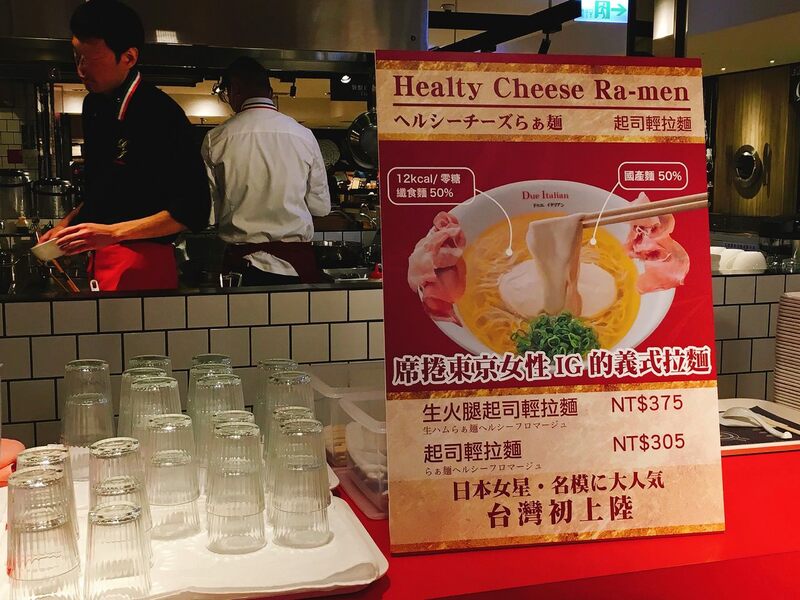 It is similar with “Menya Masato Ramen”, which is salty and full of chicken soup aroma. The green onion didn’t affect the soup at all, which is great. 至於細麵的部分, 若是能硬一點會更好. 再將薄片鹹火腿浸入湯頭, 增加多一層的肉香風味, 大概吃到一半時再將起司攪拌均勻, 整道料理瞬間成為類似有湯的白醬義大利麵. 點這道拉麵會附一張卡, 上面標示這碗拉麵有附一碗白飯, 需到櫃台換白飯, 可倒在湯裡變成湯泡飯, 因為我是一個偏好傳統日式拉麵的人, 我比較不習慣東西合併的拉麵料理. 我會推薦給喜歡創意料理的人. As for the thin noodle, it would be better if it has hard texture. 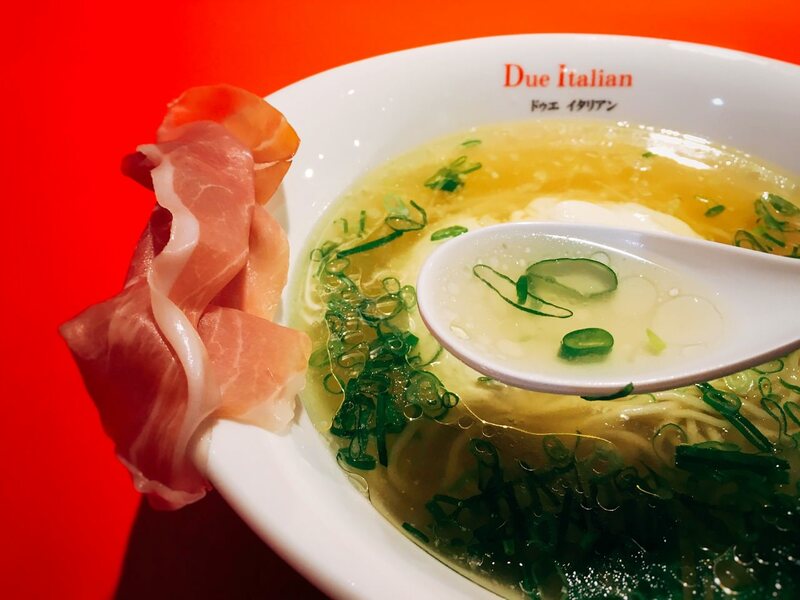 The sliced ham would increase more meaty flavor in the broth. It would be better to mix the cheese when eating until 1/2 left. The dish would immediately transferred into pasta with watery light cheese sauce. There will be a card, which can be exchanged for a bowl of rice. 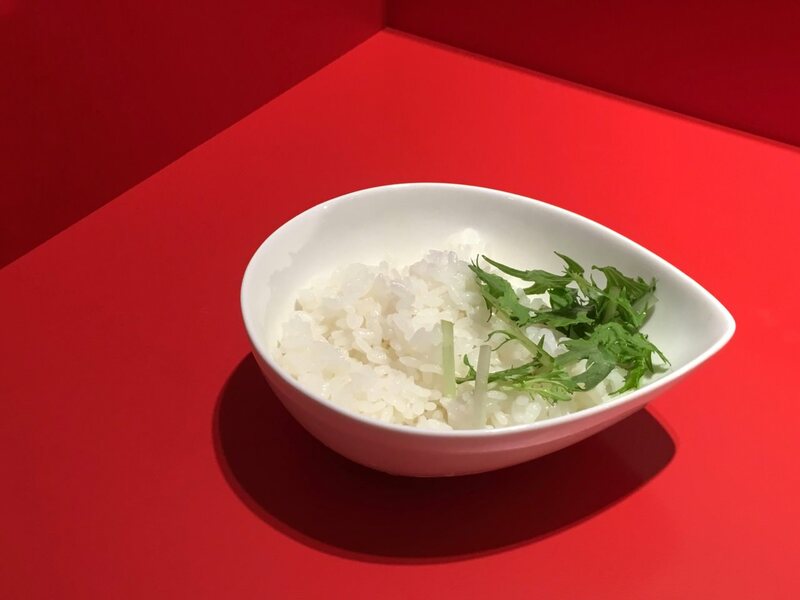 The instruction would be put the rice in the soup and becomes a whole new dish. However, I prefer the traditional Japanese Ramen, therefore, I am not used to this fusion style ramen. But, I will still recommend this dish to the people who like creative dish.